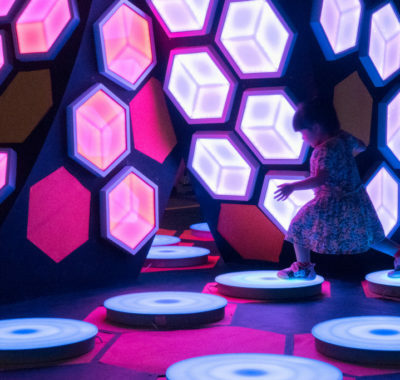 Experience fresh sensorial art experiences across the Civic District in a two-part special at the Light to Night Festival 2019. We bring you a preview of immersive highlights families and kids will particularly enjoy. 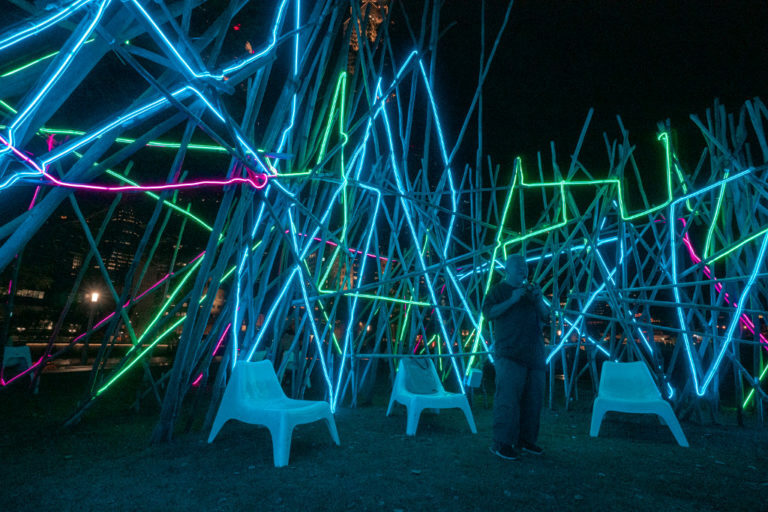 If you enjoyed the first two editions of the Light to Night Festival, then you’re in for a brilliant treat. 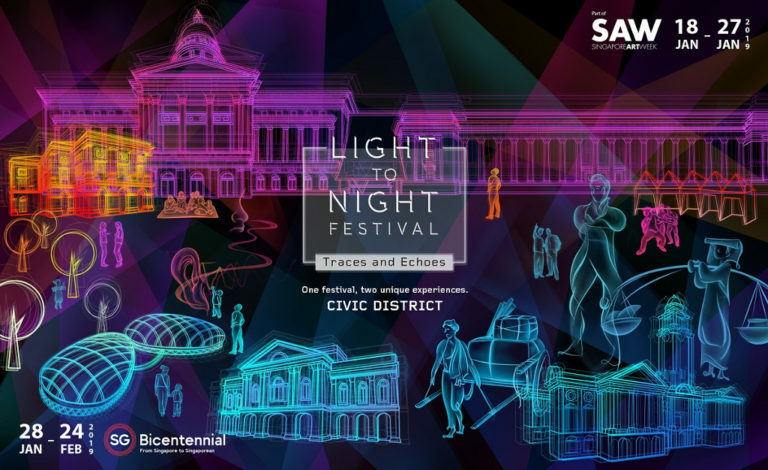 Starting tomorrow, the Light to Night Festival 2019 is set to light up the Civic District with a two-part bumper edition spanning six whole weeks! 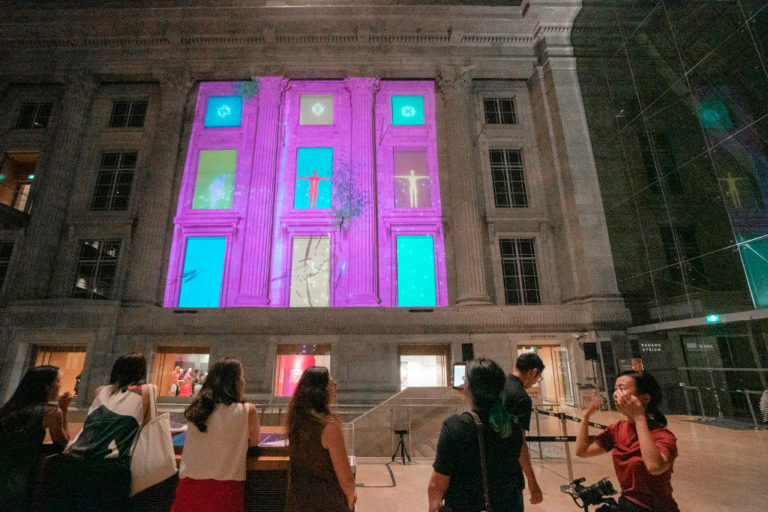 Spearheaded by National Gallery Singapore, it’s touted as one festival offering two unique experiences, as its theme “Traces and Echoes” suggests. 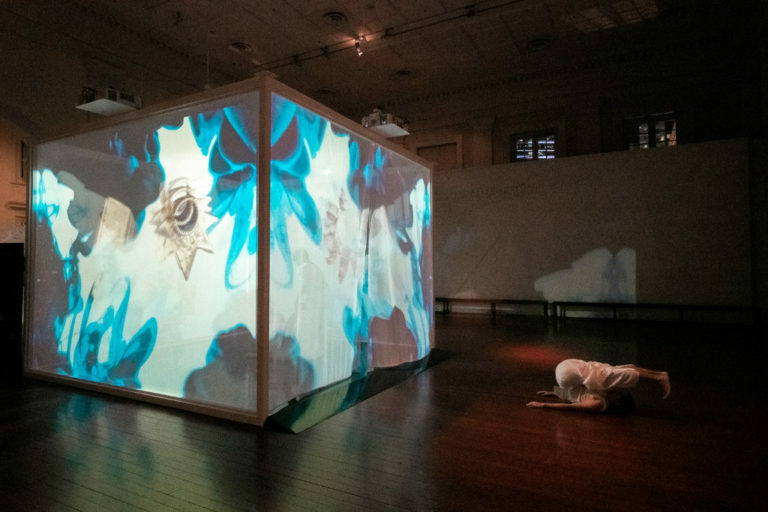 Go on a Sensorial Trail (18 Jan – 31 Mar) and challenge your senses of smell, sound and touch. 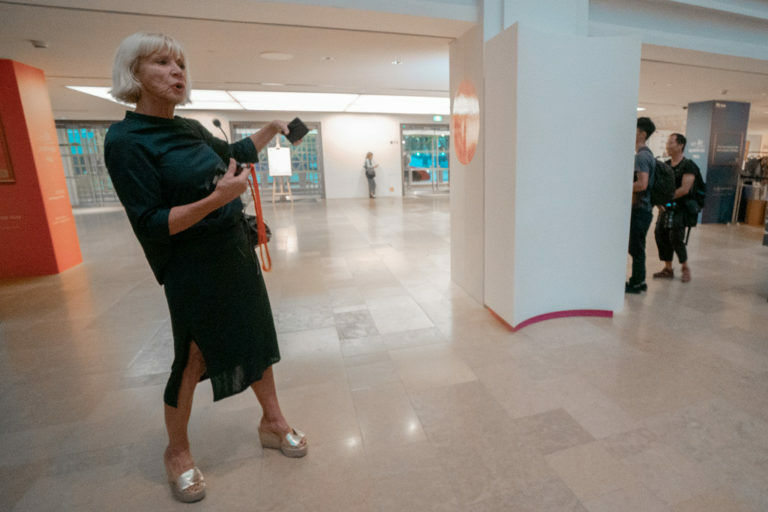 Internationally renowned scent researcher and artist Sissel Tolaas invites you to discover eau d’you Who Am I. She engaged Singaporean youth to take her on a tour of their everyday lives and compiled her scent findings. See how many smells you can identify. Touch, sniff and even kiss the wall – your heat signature leaves your DNA’s scent behind too! 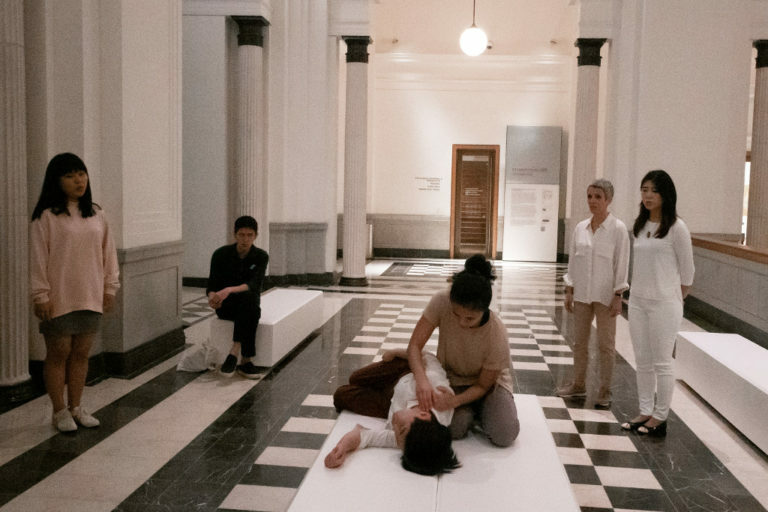 Next up, French artist Tal Isaac Hadad introduces visitors to ASMR (Autonomous Sensory Meridian Response), a minimalist soundscape inspired by social media and digital culture. Then be entranced by Recital for Masseur (2-6pm on 18-20 Jan, 23-27 Jan & 30 Jan – 3 Feb), where a group of acapella singers and masseurs combine their arts. Body massage and harmonic voices come together in perfect synaesthesia – you have to experience it to believe it! In the third segment of the Sensorial Trail, Singaporean composer-musician – and young daddy – Andy Chia calls upon you to discover connections between sounds you hear and their visual effect. In Voices of Time, you’ll encounter sounds from nature as well as digitally composed soundscapes. Inspired? You can create your own compositions and see them visually come to life! P.S. 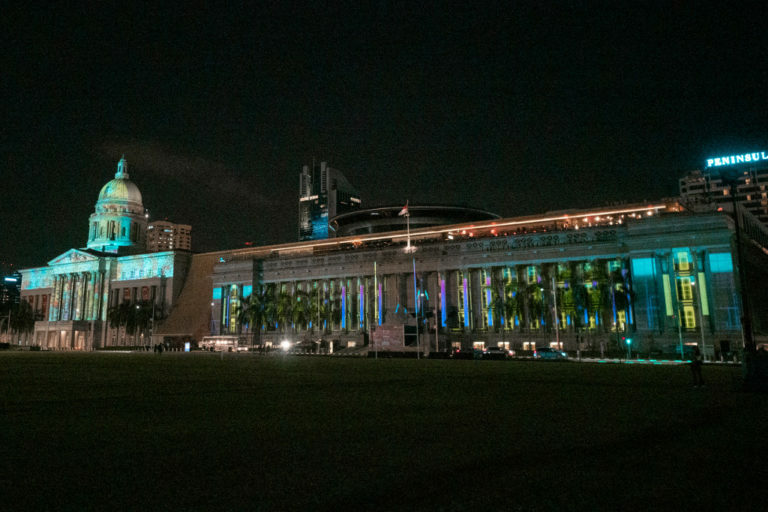 As part of Light to Night Festival 2019, all visitors enjoy complimentary admission to all exhibitions at National Gallery Singapore from 22-24 February, including special exhibition Minimalism: Space. Light. Object, with extended opening hours till 10pm. Stroll over to The Arts House, where kids will naturally be drawn to two giant books sitting on the Lawn. Both are part of an installation called open books (18 Jan – 24 Feb) by Tell Your Children, Tan Zi Xi (MessyMsxi) and The Merry Men Works. See if you can guess which fantasy story books the artists have reimagined into these whimsical larger-than-life forms. Drop by the library to borrow copies to read with your kids afterwards! 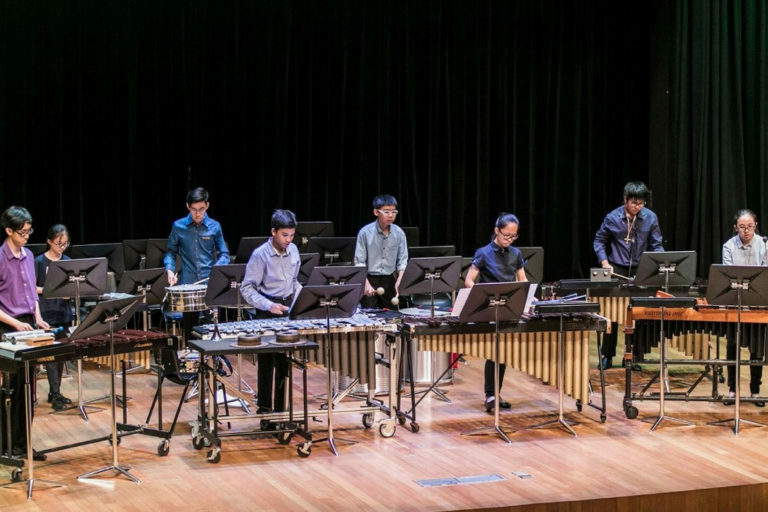 Let the SNYO Percussion Ensemble take you on an unforgettable aural and visual journey in Pitch Black (8.30pm-9pm, 9.30pm-10pm on 26 Jan). Part of the Singapore National Youth Orchestra, the young musicians will explore silence, sound and spectacle in complete darkness! The clever use of UV lights will guide your eyes. Admission is free, but do pre-register online as seats are limited. 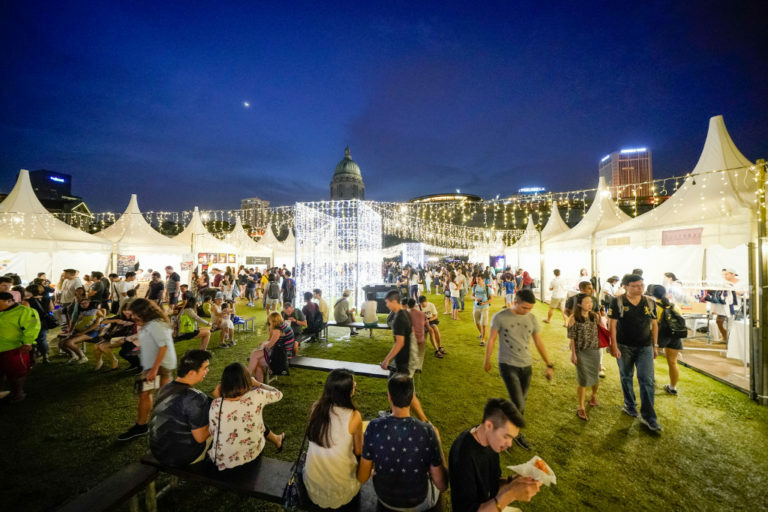 Sensorial experiences are not complete without the sense of taste, and that’s exactly what you’ll find at Art X Social (25-26 Jan & 1-2 Feb) at The Empress Lawn and St Andrew’s Road. Bring your picnic mats and bond with friends and family over art, food and music at the Festival Food Village. 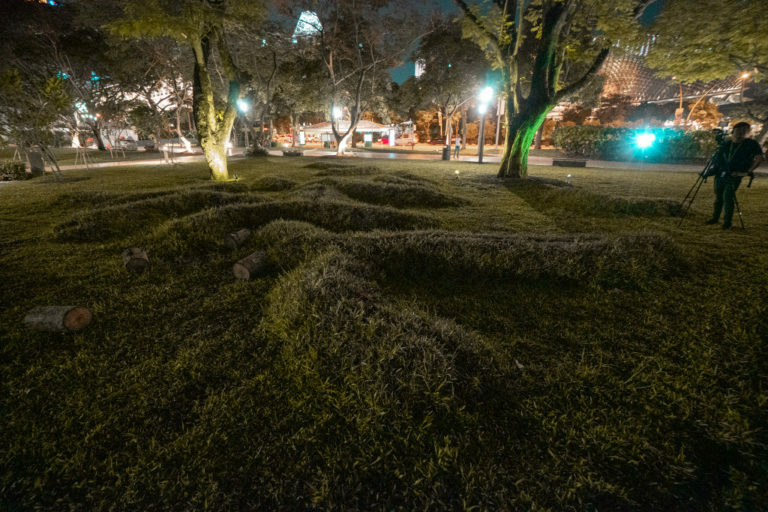 It’s also a great spot to sit back and admire the light projections – read on for more details on that! All aboard MASH-UP’s fashionable interpretation of the Wrecking of the Fame (18 Jan – 24 Feb), the ship Sir Stamford Raffles famously travelled back to London in. Raffles and his family may have survived the fiery wreck, but his collection of treasures didn’t. Let the kids explore this shipwreck – it’s safely anchored to the ground floor at the ACM. Outside on the ACM Green, rediscover the childhood game of pick up sticks. 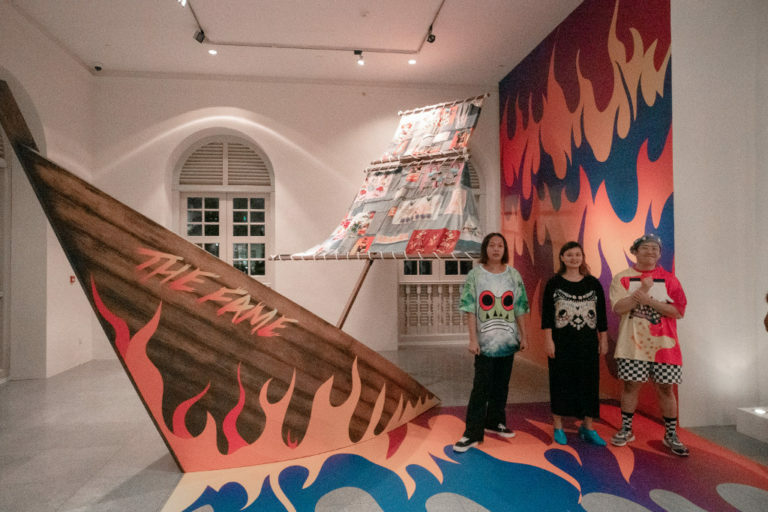 Sticks (18 Jan – 24 Feb) combines that with bakau pile construction, two icons slowly fading from modern day life in Singapore. Artist Sebastian Chun asks festival-goers to step in and share your own personal stories before they too fade away. 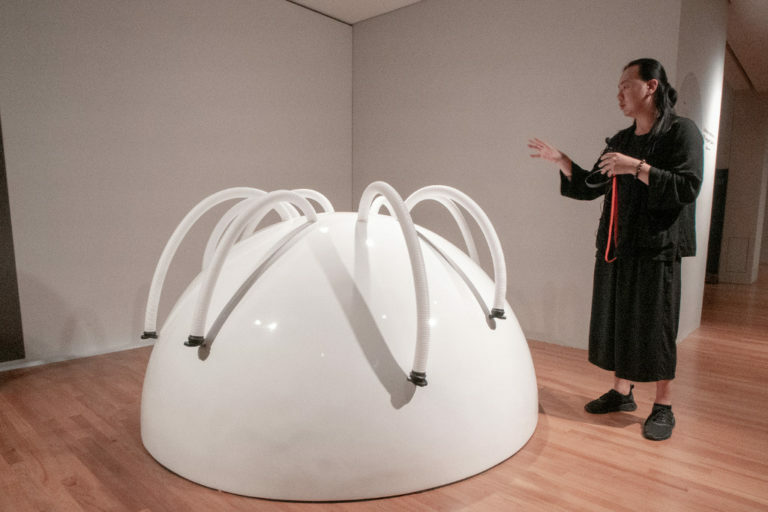 Before you head to the next zone, wander through Resonance (18 Jan – 24 Feb) by students from the Nanyang Academy of Fine Arts. An artwork bridging past, present and future, the glittering tunnel invites you to tug or push on the metal mesh it’s constructed with. While each action may affect the future, the present is transient, vanishing into the past in a moment. Deep, right? 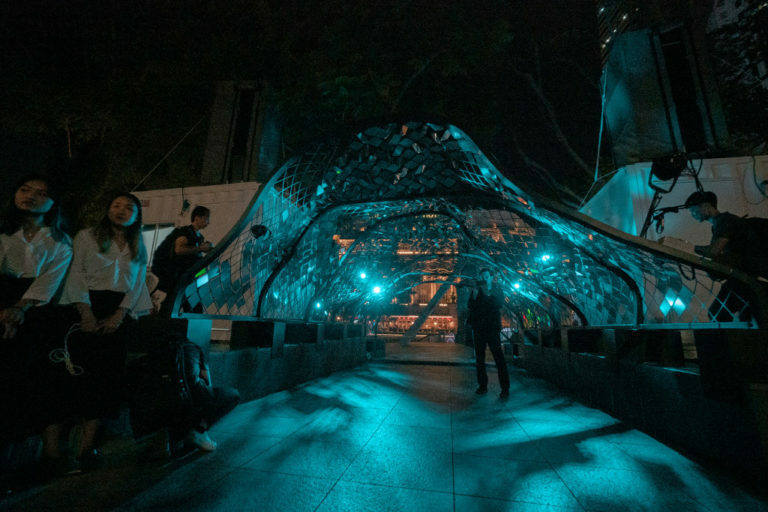 Drawing on Esplanade Park’s rich history as a hangout for both lovers and loners, artists Kaylene Tan and Ben Slater lead a collaborative in creating Under the Five Trees (18 Jan – 30 Apr). Bring along your phone (to scan QR codes) and headphones to listen to the music and tales at each tree. The kids will love trampling through the grassy mounds and balancing on logs laid to pasture. By the way, ask Grandpa and Grandma if they recall what the Hokkien translation of Under the Five Trees means! 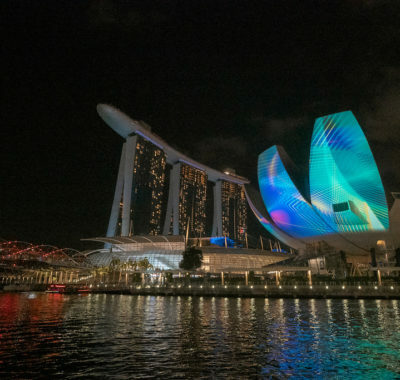 Of course, we can’t talk about the Light to Night Festival without mentioning the biggest façade light show in Singapore. Art Skins on Monuments returns with a new spectacle. Follow the artistic voyage of an Explorer who journeys across seven façades of our cherished cultural institutions. Join the Explorer on his search for his identity across dual worlds, starting at the National Gallery Singapore. His journey begins (facing the Padang) in two parts – Day & Night, while part three – Light & Shadow, continues at the Supreme Court Wing (facing The Arts House). 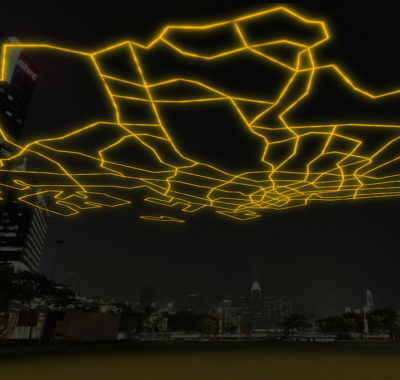 Next, head indoors to the Padang Atrium within the National Gallery Singapore for Stasis & Flux. There you’ll get the chance to influence the Explorer’s journey – the kids will love this! 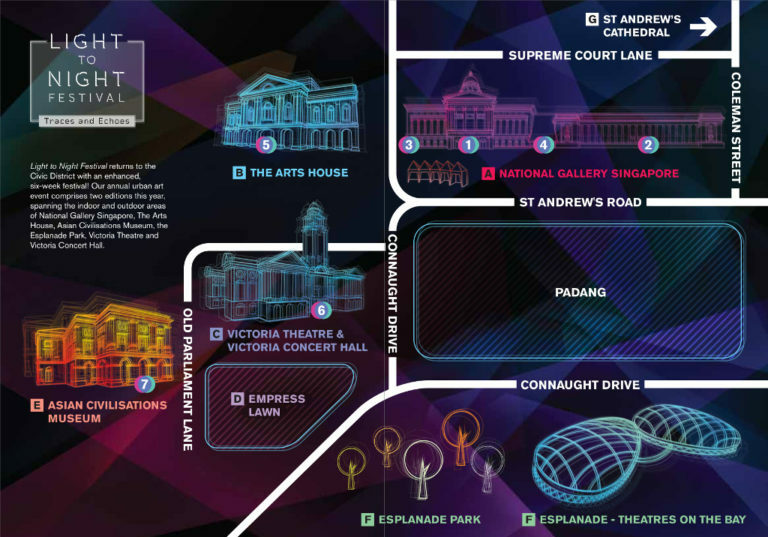 Parts five and six – Order & Chaos and Growth & Decay, light up the façades of The Arts House and Victoria Theatre & Victoria Concert Hall respectively. The finale happens at the ACM, where the Explorer realises that his wanderings have come full circle in Dreams & Reality. The best part? There’s more! We’ve only talked about a handful of highlights at each Zone, so do check out this handy brochure for more. 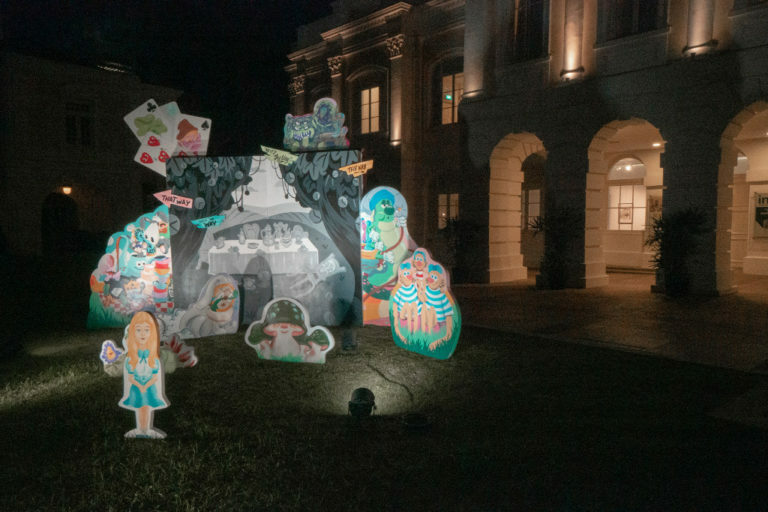 They range from more art installations and exhibits to workshops, performances, a Pop-up Bookstore, Book Clubbing Night, and tours at St Andrew’s Cathedral. There will even be Comedy Fridays and Music Saturdays at National Gallery Singapore’s Padang Atrium to look forward to. And it still doesn’t end there! The Bicentennial Edition kicks off the evening after the Art Week Edition comes to a close. 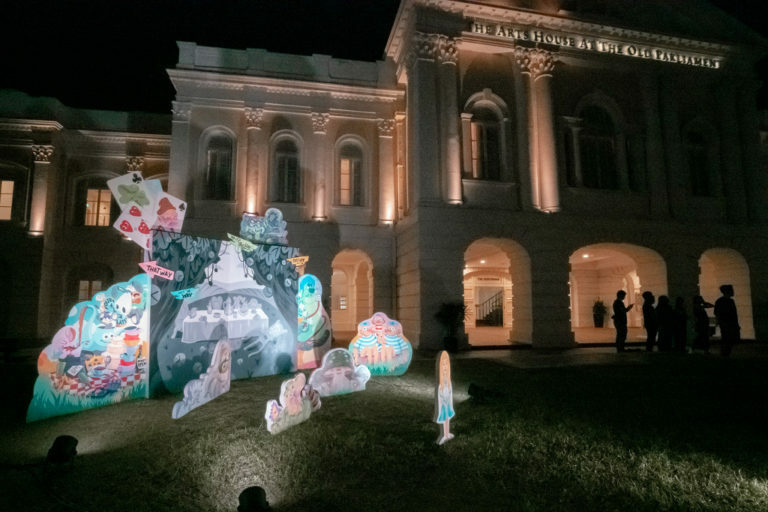 Part two of the Light to Night Festival 2019 commemorates Singapore’s Bicentennial by incorporating the little red dot’s historical narrative for the very first time. Stay tuned!